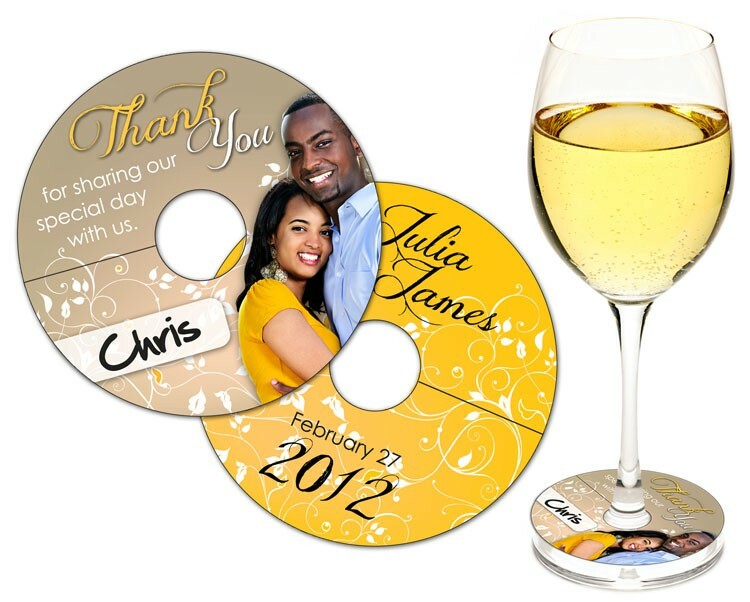 Wine Glass Tag - Extra-Thick UV-Coated (1S) - 3 Inch Diameter - 14 pt. Wine Glass Tags are great for any occasion! Perfect for weddings, parties, graduations and any get together where you want to share a special message or advertisement with your guests. The UV coating is writable, so your guests can personalize them to avoid the dreaded "glass mix-up". This is not a coaster, or a sticker, it has a slit cut into it to fit around the bottom of a wine glass above the stem, so you can remember which drink is yours when it comes time to raise a glass. Center hole is .75 inch diameter. 14 pt. UV-Coated (1S) Paper. Price includes printing in full-color (four color process) on one or both sides, and UV-coating on one side only. Exact color matches, metallic and fluorescent colors not available in full-color.